Not to be confused with Putnam, New York. Putnam County is a county located in the U.S. state of New York. As of the 2010 census, the population was 99,710. The county seat is Carmel. Putnam County formed in 1812 from Dutchess County and is named for Israel Putnam, a hero in the French and Indian War and a general in the American Revolutionary War. Putnam County is included in the New York-Newark-Jersey City, NY-NJ-PA Metropolitan Statistical Area. It is located in the lower Hudson River Valley. Midtown Manhattan is around a one-hour drive, and Grand Central Terminal is approximately 1 hour, 20 minute train ride from the county. It is one of the most affluent counties in America, ranked 7th by median household income, and 43rd by per-capita income, according to the 2012 American Community Survey and 2009-2013 American Community Survey, respectively. In 1609, a Native American people called the Wappinger inhabited the east bank of the Hudson River. They farmed, hunted, and fished throughout their range, often encountering Dutch fur traders. They obtained metal tools and goods such as alcohol and firearms in exchange for furs. 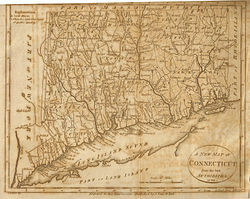 The colonial Province of New York and the Connecticut Colony negotiated an agreement on November 28, 1683, establishing their border as 20 miles (32 km) east of the Hudson River, and north to Massachusetts. Dutchess county was organized as one of New York's twelve counties. It included all of today's Putnam County and two towns in the present Columbia county. Until 1713, Dutchess was administered by Ulster county. In 1691, a group of Dutch traders purchased a tract of land from the Wappingers that spanned from the Hudson River to the Connecticut border. Six years later they sold it to wealthy Dutch-American merchant Adolphus Philipse, who obtained a Royal sanction for a "Highland Patent" (later to be known as the Philipse Patent) that encompassed most of today's Putnam County. Unknown at that time was a veer in the river's path to the northwest at the Hudson Highlands. This generated a dispute over a roughly 2-mile-wide section of border between northern Westchester County and then-Dutchess counties and the Connecticut Colony; it came to be known as "The Oblong". In 1737, the New York Colonial Assembly designated the Philipse Patent as the South Precinct of Dutchess County. The Philipses began leasing farms to migrants from Massachusetts, Connecticut, Long Island, and lower Westchester. After Adolph Philipse's death, the Patent was divided in 1754 into nine lots granted to three heirs: Mary Philipse, Philip Philipse, and Susannah Philipse Robinson. During the French and Indian War, many of the Wappinger went to Stockbridge, Massachusetts. During the Revolution, the Philipses stayed loyal to the Crown. As a consequence, their lands were confiscated by the New York government. It sold the Philipse Patent along with the rest of their holdings. The dispute over The Oblong was resolved in the aftermath of the war, with the heavily settled tract being incorporated as the first of two versions of the Town of Southeast. Also resolved were two "Gores", the Beekman Gore and the Rombout Gore, which being geographically similar to the Livingston and Beekman patents they abutted, were ceded by the Philipses to Dutchess County in 1758 and 1771 respectively. Due to the increasing population of the Southern Precinct of Dutchess County and the great distance of these communities from the county seat, Poughkeepsie, Putnam was split from Dutchess in 1812. It was organized as an independent county. It encompassed all of the Philipse Patent and the Oblong abutting it, less a triangular area in the farthest northwest reach of the Patent. There, a lowland near Fishkill Creek isolated from the rest of Putnam County and its adjacent upland drainage leading into the Hudson Highlands to the south, were ceded to Dutchess. Putnam travelers mostly used boats and ships along the Hudson River. Boats transporting goods traveled up the Hudson to ports, mainly at Peekskill, New York. They were transported by road into Putnam County, or goods were unloaded in Putnam County at Cold Spring, New York. Such transport suffered in winter, when the river froze. At that time, little food or goods could be shipped to the county. The Philipstown Turnpike was created in 1815 as a toll road from Cold Spring to Connecticut. The wagons that traveled the road would transport produce from eastern Putnam County and iron ore from the mines. The route of the turnpike can roughly be traced today: Rt 301 from Cold Spring to Farmers Mills Road, to White Pond Road to Pecksville, then Holmes Rd to Patterson, then Quaker Hill Rd to Connecticut. Transportation improved with the advent of the railroad, namely the Harlem Line, which was built in the 1840s, connecting Putnam by rail to New York City. Originally there were four stations on the Harlem line in Putnam County: Brewster, Dykemans, Towners, and Patterson. Today only the Brewster and Patterson stops remain; a new one called Southeast was added in modern times. Putnam County played an important role in the Civil War. One third of the county's men between the ages of 15 and 55 served in the military during the war years. During the post-Civil War years, industry and agriculture suffered losses as the economy contracted. Iron, which was produced in the Highland Mountains, could be found elsewhere. Agriculture was also affected greatly. The increasing need for drinking water in New York City led the city to search for sources in the Hudson Valley. In Putnam County, much of the farmland was flooded to create reservoirs. The abandoning of farms, the creation of reservoirs, and the preservation of the remaining open land resulted in scenic lands that drew large amounts of tourism from New York City. By the 20th century, improved roads brought vacationers from New York City. The Taconic State Parkway was constructed during the Great Depression as one of numerous infrastructure projects in the state and country. This brought more vacationers from the city, who were attracted to the scenic lands and the inexpensive hotels, inns, and summer houses. Putnam County's population doubled during the summer months. After World War II, Putnam County became an exurb of New York City. Rapid suburban development occurred and the county became a bedroom community. However, the protection of Putnam county's reservoirs inherently limited development, as much of the land in the county is close to wetlands or reservoirs. Governmental operations in Putnam County are outlined in the County Charter, which was approved by the voters of the County in November 1977. It is administered by a County Executive, elected at-large, and a 9-member County Legislature, elected from single-member districts. The current County Executive is Mary Ellen Odell. She won a special election for the office in November 2011, following her defeat in 2010 for such office by then-state Senator Vincent Leibell. In 2010 Leibell pleaded guilty to two federal felony charges in 2010. Following a plea agreement with the US Attorney for the Southern District of New York, Leibell resigned his state Senate seat and did not assume the office of County Executive on January 1, 2011. Prior to the Charter form of government, the County's affairs were managed by a six-member Board of Supervisors (one Supervisor from each town in the County). As the towns had populations of differing size, these geographic districts violated the principle of "one man, one vote." County Legislators are elected for three-year terms, and since 2011 are limited to four three-year terms in office. Legislative terms are staggered so that one-third of the legislative terms end every year. *The County Charter took effect on January 1, 1979 and the County Legislature was established on that day. The County Board of Supervisors was dissolved on the previous day and members of the County Legislature for the year 1979 were the supervisors of each of the six towns. Ethel Forkell was Supervisor of the Town of Kent and was elected by her colleagues as the first Chair of the County Legislature. There are three types of general trial courts in Putnam County: the New York Supreme Court, the County Court and the Justice Courts. The Supreme Court is the trial level court of the New York State Unified Court System, which presents some confusion as the Supreme Court is the highest court of appeals in the federal system as well as in most states, whereas the Court of Appeals is the highest court in New York. The Supreme Court has broad authority over all categories of cases, both civil and criminal. Generally the Supreme Court in Putnam hears civil cases involving claims in excess of $25,000. While the Supreme Court has jurisdiction over criminal cases in most counties this is handled by the County Courts. In Putnam however, the Supreme Court does exercise jurisdiction over some criminal cases. The County Court is authorized to hear all criminal cases that have occurred in the county as well as limited jurisdiction over civil cases. The County Court handles felony cases exclusively and shares jurisdiction with the town and village justice courts on misdemeanor cases and other minor offenses and violations. The County Court's jurisdiction on civil cases is limited to those involving less than $25,000. The Historic Putnam County Courthouse is located in the town of Carmel. Built in 1814 in Greek Revival style, it is the second oldest working courthouse in New York, second to the one in Johnstown. Portico and pillars were added to the structure in the 1840s. It was recently extensively remodeled to preserve the structure and adapt it for use as the Surrogate's Court. The New Putnam County Courthouse opened on January 2, 2008. It was constructed at a cost of $22.8 million. Jury assembly, court clerks and a public law library are located on the first floor. The second floor includes a Family Court and hearing room. On all floors are judges' chambers, jury deliberation rooms, prisoner cells and conference rooms. The third floor has two courtrooms for the County Court. The Supreme Court and a law library occupy the fourth floor. The towns of Carmel and Kent, as well as the villages of Brewster and Cold Spring, have their own police departments. Primary law enforcement services for the rest of Putnam County are provided by the New York State Police and the Putnam County Sheriff's Department. The current Sheriff, Robert L. Langley, Jr. was elected on November 7, 2017. The Sheriff's Department includes a Civil Bureau, patrol division, a marine unit, a motorcycle unit, a school resource unit, and a narcotics enforcement unit. Putnam County is part of the 94th State Assembly District (Towns of Carmel, Patterson, Putnam Valley and Southeast), represented by Kevin M. Byrne (R), and the 95th State Assembly District (Towns of Kent and Phillipstown), represented by Sandra R. Galef (D). Putnam County is part of the 40th State Senate District (Towns of Carmel, Patterson and Southeast), represented by Terrence P. Murphy (R), and the 41st State Senate District (Towns of Kent, Phillipstown and Putnam Valley), represented by Susan J. Serino (R). Putnam County is located in the 18th congressional district and has been represented by Democratic United States Congressman Sean Patrick Maloney since 2013. He unseated Republican Congresswoman Nan Hayworth. Putnam County has voted solidly for Republican presidential candidates, largely bucking the Democratic trend in the New York City suburbs. Since 1892, the only Democratic presidential nominees to carry Putnam County have been Woodrow Wilson in 1912 and Lyndon B. Johnson in 1964. The terrain of the county is generally hilly. The region of the county nearest the Hudson River is especially so, and is part of the Hudson Highlands. The highest point in Putnam County is Scofield Ridge, with four summits at approximately 1,540 feet (469 m) above sea level. The lowest point is sea level along the Hudson. The Hudson River, named for Henry Hudson, has provided transportation of goods from New York City, north to the Hudson Valley, throughout history. Between the hills and glacial moraine, Putnam County's valleys contain numerous wetlands (including part of the Great Swamp), creeks, ponds, lakes (including the 583 acre Lake Mahopac), and reservoirs. Putnam County is known for its many reservoirs, part of the New York City water supply system's Croton Watershed. Some of the larger include Bog Brook in Southeast; Croton Falls Reservoir in Carmel and Southeast; Diverting Reservoir in Southeast; East Branch in Brewster; Middle Branch Reservoir in Southeast; West Branch in Kent and Carmel, and Boyds Corner Reservoir in Kent. There are also three controlled lakes in the system in the town of Carmel. The climate of Putnam County is humid continental, as is most of New York. In the winter, bouts of cold, dry air arrive from Canada, and interior sections of North America. In the summer, the Gulf Stream brings hot, moist, humid air to the county. Extratropical storms often affect the county; in the winter, Nor'easters bring heavy snow and rain, and sometimes high wind. In the summer and fall, back door cold fronts move in from the north and bring thunderstorms, sometimes severe. Putnam County receives on average 36 inches of snowfall a year. Monthly Normal High and Low Temperatures For Carmel, New York on the top and average monthly precipitation in inches on the lower section. 3.58" 3.10" 4.06" 4.44" 4.33" 4.11" 5.07" 4.09" 4.72" 4.12" 4.42" 3.86"
The county has six public school districts: Brewster, Carmel, Garrison, Haldane, Mahopac, and Putnam Valley. Mahopac is the largest school district in Putnam County, educating more than 5,000 students in four elementary schools, a middle school, and a high school (1600 students). The library system consists of eight libraries; the Brewster Public Library in Brewster; the Kent Public Library in Kent; the Reed Memorial Library in Carmel; the Julia L. Butterfield Memorial Library in Cold Spring; the Alice Curtis Desmond and Hamilton Fish Library in Garrison; the Mahopac Public Library in Mahopac; the Patterson Library in Patterson, and the Putnam Valley Free Library in Putnam Valley. Putnam has no unit of any college, university, or other institution of higher education. Putnam County is provided with the majority of its electricity from the nuclear Indian Point Energy Center in Westchester County. Water is supplied from wells, the City of New York's local reservoirs and controlled lakes, or from the Hudson River. The Putnam Hospital Center, located in Carmel, serves the eastern county. Western Putnam County is mainly served by hospitals in Dutchess or Westchester counties. Putnam has two interstate highways. The east-west Interstate 84 comes in from the north near Ludingtonville, and connects to the southbound Interstate 684 in Southeast toward the Connecticut border. The Taconic State Parkway, another high-speed through road, runs north-south through central Putnam. US 9 runs north-south in the western part of the county, paralleled by NY 9D along the Hudson River. NY 22 runs north-south in the eastern part of the county. NY 301 runs east-west from Cold Spring to Carmel. The short NY 403 connects 9 and 9D near Garrison. Three of the region's major east-west routes traverse the eastern half of the county. NY 52 enters alongside I-84 from Dutchess County, to end at US 6 south of Carmel. East of Brewster, US 6 joins US 202 and the routes leave the county and state concurrently aside the interstate. The County's Dept. of Highways and Facilities maintains a number of county roads, and it performs snow and ice control on portions of the following numbered highways within the county: U.S. Route 6 from Westchester County line to the NY 22/U.S. Route 202 concurrency; NY 6N for the entire duration within Putnam; NY 9D from NY 301 to the Dutchess County line; NY 52 from its southern terminus to NY 311; NY 164 for its entire duration, and NY 301 for its entire duration. The county has several passenger trains that serve the county. The Harlem Line and the Hudson Line of the Metro-North Railroad run north-south in Putnam. The Harlem Line makes stops at Brewster, Southeast, and Patterson. The Hudson Line makes stops at Manitou, Garrison, Cold Spring, and Breakneck Ridge. A connection to Amtrak can be made to the south at Croton-Harmon in upper Westchester County or to the north at Poughkeepsie in Dutchess County, both on the Hudson Line. Grand Central Terminal in Manhattan is roughly a one-hour train ride. Until May 1958, a third commuter line (nicknamed "Old Put") operating between the Bronx and Brewster, served the region. With no direct connection to Grand Central Terminal (a transfer was required in the Bronx), ridership on the line was weak compared to its counterparts. Freight service was also scant. The line was eventually abandoned in waves between 1962 and 1980. The former railbed has been converted to trails, and now serves as the South County Trailway, North County Trailway, and Putnam County Trailway rail trails. Putnam Transit, operated by the county, provides local public transportation. In contrast to the surrounding counties, Putnam has no airport. Chuang Yen Monastery, located in Kent is home to the largest indoor Buddha statue in the Western Hemisphere. It has the only library in the United States specializing in Buddhist history. The Journal News serves the region known as the Lower Hudson Valley, which comprises Westchester County, Rockland County, and Putnam County. The Journal News is owned by Gannett Company, Inc. Before Gannett merged its local dailies into the Journal News, Putnam County was served by an edition of the Reporter Dispatch. Putnam County newsreaders were served for generations by the Putnam County News and Recorder, formerly been an independently owned newspaper devoted to local affairs. The oversized broadsheet – measuring seventeen by twenty inches – was first published in Cold Spring as The Recorder in 1866. In July 2008, the local ownership sold the paper to Roger Ailes, chairman of Fox News, who named his wife Elizabeth as the new publisher. The paper altered its editorial content substantially, generating local controversy. In 2009 the Ailes family also purchased the Putnam County Courier, when it was shut down by Journal Register Co. (The first issue after publication resumed listed Roger Ailes as owner and chairman, but Elizabeth Ailes has since been identified as the owner). The Courier was first established as the Putnam County Democrat in 1841. Under Ailes ownership, the Courier closed its Carmel office. In 2013 the paper was reduced from broadsheet to Berliner (format). The News and Recorder remained a full broadsheet, with a 17-inch-wide front page,until 2017. The two newspapers share an editor and many of the same stories appear in both. Douglas Cunningham, editor-in-chief of the Courier and News & Recorder since 2011, purchased the two papers from the Ailes in December 2016 and became publisher. Two other weeklies are the Putnam County Times (historically Times & Republican) and Putnam County Press, virtually identical except that the former is distributed free. Both have been owned since 1958 by Don Hall. Hall and Roger Ailes, though both Republicans, are bitter rivals. Hall had long derided Ailes as a part-time resident. When Ailes faced harassment allegations, leading to his ouster from Fox News, his Putnam County connection contributed to his being featured on the front pages of the Times and Press. In 2010, Gordon Stewart, a businessman living in Garrison, launched a news website to compete with the Ailes-owned PCNR called Philipstown.info. In 2012 a print version was launched called The Paper. Shortly Stewart's death in 2014, the publication became a nonprofit led by a board of directors. It changed its name in 2016 to The Highlands Current to reflect its coverage of neighboring Beacon. The Chuang Yen Monastery (莊嚴寺), in Kent, houses the largest indoor statue of Buddha in the Western Hemisphere. Carmel is the county seat of Putnam County, with a population of 34,300. The Town of Carmel includes the hamlets of Carmel, Carmel Hills, Field Corners, Hopkins Corners, Mahopac, Mahopac Falls, Secor Corners, Tilly Foster, and West Mahopac. Carmel is along the southern border of Putnam County. Carmel is known for its historic courthouse and high school, which serves grades 9–12. Carmel was taken in 1795 from Frederickstown, a town which encompassed the present towns of Kent, Patterson, and Carmel. Kent is a town located along the northern border of Putnam with a population of 14,000. Kent contains the hamlets of Lake Carmel, Kent Corners, Kent Hills, and Ludingtonville. Kent was the last remaining section of Frederickstown, after the towns of Carmel and Patterson were divided from it in 1795. Frederickstown was founded in 1788. The Town of Patterson is located in the northeast area of Putnam County and has a population of 12,000. Patterson, originally named Franklin, was divided from the former town of Frederickstown, in 1795. Patterson contains the hamlets of Patterson, Barnum Corners, Camp Brady, Fields Corners, Haines Corners, Haviland Hollow, Putnam Lake, Steinbeck Corners, Towners, and West Patterson. Cold Spring's Main Street, part of the federally recognized historic district in the village. Philipstown is a town located along the western end of Putnam County and it has a population of 10,000. Philipstown contains the villages and hamlets of Cold Spring, Forsonville, Garrison, Garrison Four Corners, Glenclyffe, Manitou, McKeel Corners, Nelsonville, North Highland, Storm King, and the north side of Continental Village. It was founded in 1788. West Point (in Orange County) is located across the Hudson River from the village of Cold Spring. It has three stations on the Metro North Railroad Hudson line: in Garrison, Cold Spring and Manitou, which has limited train service. Two public libraries are located in Philipstown: the Desmond-Fish Library in Garrison and the Julia L. Butterfield Library in Cold Spring. Putnam Valley is a town located on the southern border of Putnam County with a population of 11,000. Putnam Valley contains the hamlets of Adams Corners, Christian Corners, Gilbert Corners, Lake Peekskill, Oscawana Corners, Putnam Valley, Tompkins Corners, Sunnybrook. Putnam Valley was created in 1835 as the Town Of Quincy, taking its current name the following year. The town was created by splitting off from Philipstown. Putnam Valley is home to the Clarence Fahnestock State Park, which covers much of Putnam County and some of Dutchess County. The Town of Southeast is located in the southeastern corner of Putnam County, with a population of 18,000. It was founded in 1788 as one of the three original towns in what would later become Putnam County. Its shape changed greatly in 1795, when it lost its northern half to Patterson and gained a great amount on its western side. It is the second-largest town in Putnam County, second only to Carmel. The crossroads of Interstate highways 684 and 84; State Routes 22 and 312; and US Highways 6 and 202 are located here. Metro-North Railroad's Harlem Line has two stops that service the area, at Brewster Village and Southeast Station (formerly Brewster North) off Route 312. Southeast contains the village of Brewster, and the hamlets of Brewster Hill, Brewster Heights, Deans Corners, Deforest Corners, Drewville Heights, Dykemans, Milltown, Peach Lake, Sears Corners, and Sodom. Brewster is an incorporated village within the Town of Southeast. Cold Spring is an incorporated village surrounded by the Town of Philipstown and the village of Nelsonville. Nelsonville is an incorporated village surrounded by the Town of Philipstown and the village of Cold Spring. ^ "Schedules & Fares". Metro North Railroad. Retrieved 19 August 2014. ^ a b c d e f g h i j k l Putnamcountyny (2007). "Putnam County history". Putnamcountyny. Archived from the original on 2008-03-16. Retrieved 2008-01-13. Cite error: Invalid <ref> tag; name "disc1" defined multiple times with different content (see the help page). ^ a b c "History of the native Americans in Putnam County". Mahopac Library. 2008. Archived from the original on 2007-09-27. Retrieved 2008-01-29. ^ NYGenWeb Putnam County, NY - History, Chap VIII, "The Oblong". Rootsweb.ancestry.com. Retrieved on 2013-07-26. ^ Patterson Through the Years. Historicpatterson.org. Retrieved on 2013-07-26. ^ Haviland Hollow. Historicpatterson.org. Retrieved on 2013-07-26. ^ GenWeb (2006). "Putnam County". Rootsweb. Retrieved 2008-01-27. ^ a b "County Executive's Office". Putnam County, New York. 2011. Archived from the original on 2010-11-28. Retrieved 2011-01-24. ^ "Elected Officials". Putnam County Online. County of Putnam, NY. Retrieved 19 February 2017. ^ a b c New York State united court system (2007). "Courts in Putnam county". New York State united court system. Retrieved 2008-01-13. ^ Propper, David. "Shocker in Sheriff's Race and Other Putnam Election Results". The Examiner. The Putnam Examiner. Retrieved 1 January 2018. ^ "Assemblyman Kevin M. Byrne Assembly District 94". New York State Assembly. Retrieved 1 January 2018. ^ "Assemblywoman Sandy Galef Assembly District 95". New York State Assembly. Retrieved 1 January 2018. ^ "New York State Senator Terrence Murphy". The New York State Senate. New York State Senate. Retrieved 1 January 2018. ^ United States Geological Survey (2007). "Scofield Ridge". United States Geological Survey. Retrieved 2008-01-15. ^ a b "NYC Department of Environmental Protection". NYC Department of Environmental Protection. 2008. Archived from the original on 2007-10-20. Retrieved 2008-01-13. ^ a b c d Cornell Cooperative Extension (2007). "Climate of New York". Cornell Cooperative Extension. Retrieved 2008-01-30. Cite error: Invalid <ref> tag; name "climate" defined multiple times with different content (see the help page). ^ Weather.com (2007). "Averages and records for Carmel, New York". Retrieved 2008-01-29. ^ "American FactFinder". United States Census Bureau. U.S. Dept. of Commerce. Retrieved 6 January 2018. ^ "QuickFacts Putnam County, New York". United States Census Bureau. U.S. Dept. of Commerce. Retrieved 6 January 2018. ^ "Interstate 84". NYC roads. 2008. Retrieved 2008-01-14. ^ "Taconic state parkway". NYC roads. 2008. Retrieved 2008-01-14. ^ a b c Mapquest (2008). "map of Putnam county". Mapquest. Retrieved 2008-01-14. ^ "Traffic Data Report - All routes" (PDF). NYSDOT. 2007-07-16. Retrieved 2008-01-16. ^ "Metro North railroad". Metro North Railroad. 2008. Retrieved 2008-01-14. ^ Putnam County visitors bureau (2007). "Points of interest". Putnam County visitors bureau. Archived from the original on 2008-01-21. Retrieved 2008-01-16. ^ a b New York State Park Authority (2007). "Fahnestalk state park". New York State park authority. Retrieved 2008-01-15. ^ Journal News (2006). "Donald J. Trump comes to Putnam county". New York New Jersey Trail Conference. Archived from the original on 2008-01-05. Retrieved 2008-01-16. ^ Thunder Ridge ski homepage (2007). "Thunder Ridge Ski area". Thunder Ridge Ski area. Retrieved 2008-01-16. ^ "The Putnam County News & Recorder, Our History". Retrieved 12 April 2014. ^ Boyer, Peter J. (2011). "Fox Among the Chickens". The New Yorker. Condé Nast (31 January 2011): 52–61. Retrieved 25 June 2011. ^ Reiner, Dan. "Ailes family sells Putnam newspapers". lohud. www.lohud.com. Retrieved 1 January 2018. ^ "Courier, PCNR Under New Ownership". The Putnam County Courier. The Putnam County Courier, LLC. Retrieved 15 December 2016. ^ U.S. Census Bureau (2010). "Demographics of Carmel New York". U.S. Census Bureau. Retrieved 2008-01-14. ^ "Carmel High School". Carmel High School. 2007. Archived from the original on 2008-01-01. Retrieved 2008-01-15. ^ a b c d e "Putnam County history". Rootsweb. 2007. Retrieved 2008-01-15. ^ U.S. Census bureau (2006). "Population of Kent". U.S. Census bureau. Retrieved 2008-01-15. ^ U.S. census bureau (2006). "Population of Patterson". U.S. Census bureau. Retrieved 2008-01-15. ^ U.S. Census bureau (2006). "Population of Philipstown". U.S. Census bureau. Retrieved 2008-01-15. ^ U.S. Census bureau (2006). "Population of Putnam Valley". U.S. Census Bureau. Retrieved 2008-01-15. ^ U.S. Census bureau (2006). "Population of Southeast". U.S. Census bureau. Retrieved 2008-01-15. ^ a b c "Town of Southeast". Town of Southeast, New York. 2007. Archived from the original on 2007-11-07. Retrieved 2008-01-15. Wikivoyage has a travel guide for Putnam County (New York).